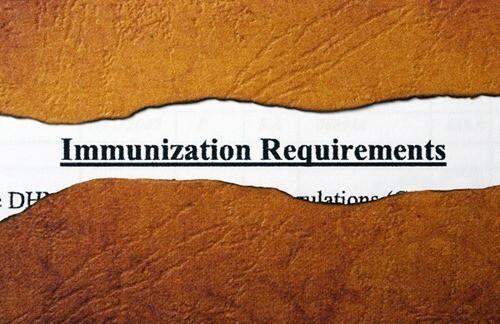 Michigan Vaccination Exemption Law Updates: Did the State Health Department Break the Law? I want my form back. I consider myself a thinking person, but sometimes I miss the obvious. At the beginning of each school year, I drown in paperwork. It took me over an hour of solid writing just to fill out forms for two – two! – of my four kids for their elementary school teachers and office paperwork. 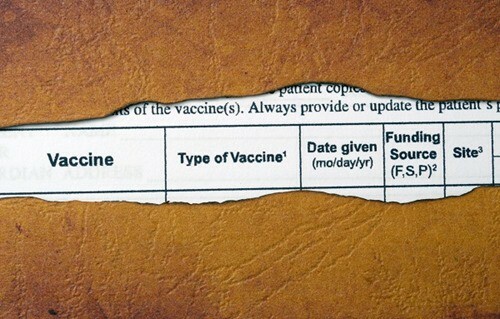 So I admit, when I get the vaccine exemption form, I fill it out just like any other form. Name, address, check this box, check that one, write “philosophical” on the “reason for exemption” line just like the school secretary told me, sign, date, done. By signing this waiver, you acknowledge that you are placing your child and others at risk of serious illness should he or she contract a disease that could have been prevented through proper vaccination. …might not be the best paper trail to leave. I can just imagine the Child Protective Services agent assigned to my wrongful case someday using that as a signed piece of evidence that I knowingly placed my child at risk. In our current world climate, I don’t think that’s paranoid at all. I can’t stop thinking about this poor mother who left her 4-year-old in the car on a mild day while she grabbed one item at a small store — and ended up arrested. I’m not going to put into writing whether I’ve ever done that before…but know that my hair stands on end thinking about having my kids taken away for something so minor. It feels like a very short leap from a mindless form-filling-out session to a piece of evidence in a crazy CPS case against me where I’m losing my parental rights because I let them walk by themselves to the bus stop PLUS I didn’t vaccinate them. But this post is not about me and mine. 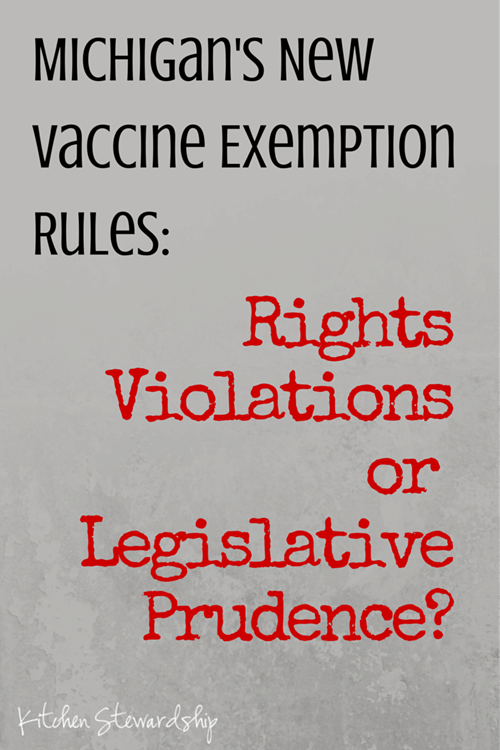 It’s about the new rule changes on vaccine exemptions in the State of Michigan as of January 1, 2015. Me, or the state health department? The vaccine exemption laws in Michigan used to be some of the most lenient, allowing for medical, religious, and philosophical objections. The federal government creates no law that requires vaccinations, but all fifty states have their own requirements to enter school. As the calendar turned to 2015e still have the opportunity to utilize all three objections in Michigan, but there’s a lot more red tape. Now, for religious or philosophical exemptions, parents are required to “receive education on the risks of not receiving the vaccines being waived and the benefits of vaccination to the individual and the community.” They also have to use the official form, no substitutes as people could in the past. 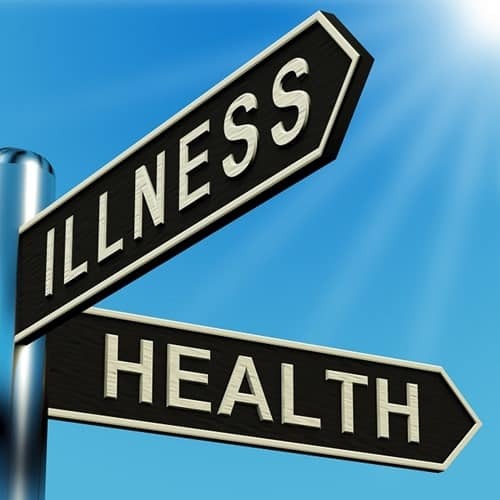 The form of education is not specified – it could be a phone conversation, pamphlet, website, or even a chat with your doctor, as long as it’s approved by the local health department. My county’s health department website does not as of yet address this at all even though the “rule” (not law) went into effect January 1 of this year. In other states that have added rules like this in recent years, Oregon last summer and Washington in 2011, multiple options are allowed. Colorado recently removed similar language from a bill; that state has the most vaccine exemptions in the nation. 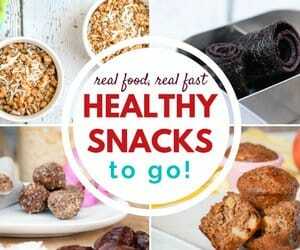 Did the Health Department Step WAY Out of Bounds? The real problems are not as much the additional hoops parents have to jump through to obtain an exemption – although more on that later – but the question of whether the state health department actually has the legal power to make this change without legislative or civilian comment or approval, as well as the issue of parental rights, and if this new rule is a slippery slope toward too much governmental control over our kids. These rule changes included about a dozen points, all of which only affected physicians, health departments and schools, what they report and how and so on. This line item was the only one that would seriously affect the populace. UPDATE: In 2007 the Attorney General discussed and explained the health department’s right to require a specific form for vaccine waivers. 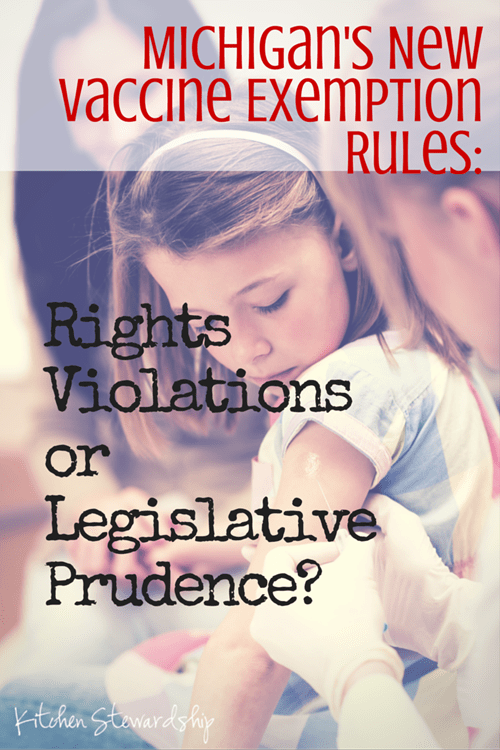 Are Parents’ Constitutional Rights Undermined? There also may be some 1st and 14th amendment rights violations going on in this rule change. 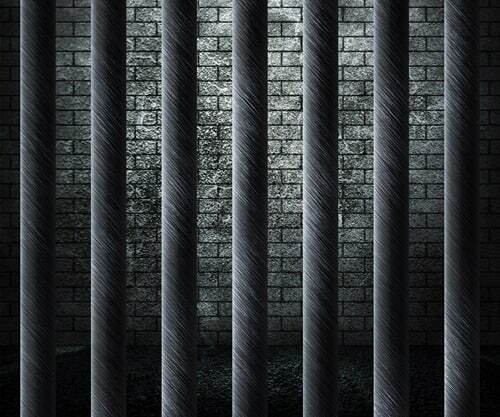 The First Amendment is the one that guarantees the right to free speech – it’s why I can write this article without getting arrested, and it’s also why the government can’t go all Old Testament on me and force me to pledge allegiance to another god that is not my own. Free speech includes the right not to speak, the guarantee that the government will not force people to say anything under penalty of law. Yet my children could be denied their right to an education if I don’t sign something that (a) I don’t agree with and (b) could incriminate me. Sounds like a tangled web to me! Do parents have the right to turn down medical treatment for their children? If you read an historical account of a parent forced to watch their 5-year-old son undergo the practice of “blood letting” where doctors used to put leeches on people to heal them from various maladies, wouldn’t you think it both bizarre and inhumane? We have the benefit of hindsight in that one. We know that leeches did more harm than good and were at best, hokey, and at worst, dangerous. Two hundred years from now, will people think the same thing when they read accounts of parents who wished to allow their son to avoid chemotherapy, a process by which toxic chemicals are injected directly into the bloodstream that make people feel very ill, make their hair fall out, and cause their immune systems to be severely compromised? We have no way of knowing what hindsight will bring. In healthcare, there are no absolutes, and there are often risks to both action and inaction. And the parents of Jacob Steiler, Isaiah Rider, Cassandra Callender and Jeremy Fraser should have been allowed to make decisions about the risks they were willing to take with their children. Justina Pelletier’s story is even more chilling – the teenager was kept from her parents but for one hour a week and subjected to fifteen months of treatment at a Boston hospital. At the end of that time, she was returned to her parents, no better than when she started, and the doctors admitted they were wrong. As I said – no absolutes. Turn the Tables: Should the Parents be Prosecuted? Those who believe vaccines are the only answer for widespread public health would turn the law against non-vaccinating parents in another way. It’s all about torts. That’s just a great word to say, so it had to be included. We in Michigan should be grateful that we have philosophical exemptions to required vaccinations as we are one of only 20 states that do, so this new rule is a better alternative than the state simply stripping it down to only medical exemptions or medical and religious exemptions allowed. So we have to get our “education” on this subject certified. It’s my hope that anyone exempting for philosophical reasons has already done exhaustive research, so your mind is likely quite made up, and it’s just a hoop to jump through. It’s annoying, but not killer. Social science shows that the education requirement won’t change most people’s minds, (source) so the state’s goal with this isn’t to solve the vaccine debate, but to put up a roadblock for the non-thinking, non-educated parents who are just opting out because it’s easier. Those parents, who are hopefully few and far between, ought not be opting out anyway if they’re not willing to do the research. The fact remains that freedoms have been tightened, perhaps even violated, with this new rule – which in itself may or may not have been a legal move by the state health department. If the health department was underhanded in this, we must ask why they thought the changes were necessary in the first place. The increase in non-medical exemptions in the state from 2% to 6% in recent years. The very recent outbreaks of whooping cough in Grand Traverse and Allegan Counties. It’s likely that the increase in exemptions was caused by one specific vaccine added to the required list in 2010: a second round of varicella. Many parents exercise caution with their children when brand new rules (and relatively new vaccine formulas) are mandated. The statistics on exemption are not recorded based on how many vaccines a parent chooses to opt out on, only which children are not completely vaccinated. The Traverse City outbreak did include many children who were unvaccinated against the disease, (source) but the reporting may have been less than ideal. Not all cases were documented. Kids who were showing symptoms were often simply given antibiotics rather than being tested, since whooping cough or pneumonia or a respiratory infection would all have the same treatment. Surely many cases were missed – dare I say especially in vaccinated individuals? Children in affected schools were told to get prophylactic antibiotics – so again, many kids who probably had pertussis treated it early without being tested and were not counted in the official totals. Plus, parents who don’t vaccinate are probably more likely to avoid preventative antibiotics, so those kids are more likely to have been officially diagnosed instead of passed over because they were not (or not very) symptomatic. This does NOT follow the CDC guidelines for an outbreak of pertussis as outlined here, which recommends active screening of suspected cases and limited, targeted use of preventative antibiotics. It is my strong opinion that the statistics publicized in the Traverse City whooping cough outbreak are confounded by inaccuracies and should have no bearing on any sort of discussion or legislation on vaccines and vaccine-preventable diseases. The health officials there did not attempt to accurately track the progression of the contagion, and an excellent opportunity for learning was missed. And believe me, I know a little bit about disease reporting since I called the health department to report my own kids after the doctor refused to. What Will the New Rule REALLY Look Like? I called the health department to find out. On January 15, 2015, they had just had their training session that afternoon, so my timing was perfect. UPDATE: This is Kent County but NOT in any way in the actual state rule. If you are asked to provide reasons, you do not need to. The parent has to use the form from the state dated 1/1/15 and must not alter it in any way. I asked what would happen if one did cross out “that phrase” that feels so criminalizing, and she said your child might not be allowed at school. My opinion? Still not very parent-friendly, but maybe less incriminating? And with a 72% effective rate on, say, the pertussis vaccine, could we really prevent those illnesses through proper vaccination? She also assured me that opting out of vaccines is not something CPS cares a whit about, that she has personally had to make medical child abuse calls to CPS and included “does not vaccinate” as one of her many pieces of evidence, and they told her that not vaccinating has nothing to do with parental neglect.She also said that it’s a medical document only sent to the health department and the school, and “CPS will not have any reason to have their eyes on this form.” It felt comforting at the time, but really – a signed document saying I knowingly put my child at risk? It seems like I’m risking more than their health there if I trust the word on one lady in one office that the form won’t be seen or cared about by people who could take my children away for less. The second reason for these forms is so that if an outbreak occurs in your child’s school, they can be asked to stay home for a few weeks. UPDATE: Some health departments in Michigan are reportedly requiring the child to come to the information session/form signing as well. This is NOT part of the law or rule or anything else, and you certainly do NOT need to bring your child with you. I have a 3-year-old who will be starting preschool next year, and he’s nowhere near “on schedule” for his vaccinations. He’s already immune to pertussis, for example, so no need for that one anymore. We’re still making decisions month by month, vaccine by vaccine, child by child. I have no idea what I’ll do when it comes to signing that form in September. I don’t feel it’s legally prudent to allow the line about “putting my child at risk” to have my signature on it. But if I don’t, John might not be able to go to preschool, and I think he’d thrive there. In the end, I hope that something changes by then, and I’ll be taking some action steps to let my democratic voice be heard. 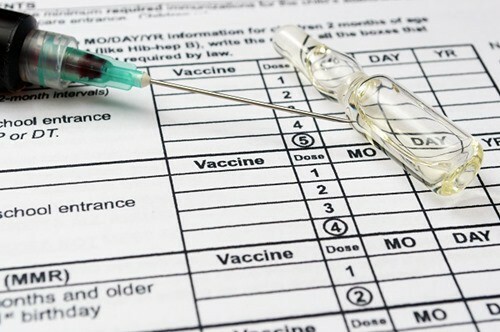 Get on the newsletter list for Michigan Opposing Mandatory Vaccines to stay up to date. NVIC is also collecting as many Michigan stories of vaccine reaction, harrassment, and failure as possible. You can always call or write your legislators directly, asking them to initiate action to remove the rule put in place by the state health department (R 325.176 of the Michigan Administrative Code) in December of 2014. Contact information for state senators and representatives is available. Many are just being sworn in to state office for the first time, so they might need some education on what you’re even talking about! Keep in mind that what you’re asking is not to enter debate on whether vaccines are necessary, effective, or anything else – just that (a) the health department did not invite public comment and should, and (b) parents should retain the right to be exempt from mandatory vaccinations. Whether you’re in Michigan or not, I’d love to open up the floor for (polite, respectful) conversation about the issue of medical parental rights. Disclaimer: I am not a medical professional and nothing in this post should be taken as medical (or legal!) advice. Photos are from GraphicStock.com. Used with permission. If that has to be signed for those who don’t vaccinate the same needs to be done for those who do. Those who get a live virus and shed on those who cannot get vaccinations. Or those who because of the vaccine contract the disease and pass it onto other – the second is the much more common reason for so called outbreaks! I agree that the Michigan legislature has over-reached however, I am not at all sure that you have your facts straight about cause of transmission. Have you references for your statements? Sara, did you read this article? It doesn’t say anything about vaccines causing transmission. It warns that the effectiveness of one’s vaccine can wear off in time, leaving one who was formerly fully vaccinated to still end up catching and even transmitting the measles. The conclusion is that monitoring for immunity years after being vaccinated is probably warranted and suggests that re-vaccination be considered. I can appreciate your concern. I happen to be an RN who has given many T-Dap vaccines to post partum mothers. Actually, now it is more common to give the vaccine while the woman is still pregnant as the baby is then born with some immunity to pertussis. The deal is, infants are very susceptible to pertussis and it tends to slam them really hard, often requiring hospitalization and occasionally it is fatal. All this from exposure to an adult who may have thought they had a mild cold. Since the stakes are high, it is felt that the risk posed by the vaccine is acceptable. The more people vaccinated, the less likely your baby will be exposed. 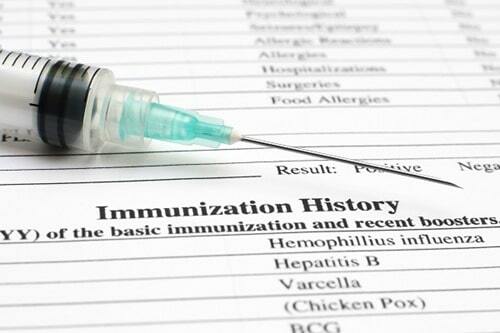 The staff are all expected to be vaccinated and I accept that because I want to be sure to do no harm to my patients. I do always ask for vaccines that are ‘thimerosol free’. Basically, I see them as an unfortunate necessity until somebody comes up with something better. I have seen documentaries that purport alterior (sp?) motives so I concur, this is something everyone has to decide for themselves. There are a lot of unknowns, nothing is crystal clear. Thank you, Linda, I very much appreciate your perspective and respect. And you may be dead on with this: “an unfortunate necessity until somebody comes up with something better.” I just get stuck at “nothing is crystal clear.” But thank you for adding to this post! As a parent who has seen first hand vaccine injured children I would like to challenge you to research how many children are dying or living with life long severe handicap and or brain function, from the very vaccines that you feel are a necessary evil. My child almost didn’t come home and now will need medical care the rest of his life. And yet I can’t get a medical exemption because my dr swears it wasn’t the vaccines that caused any of it even though he ended up in the hospital for a week w/in 24 hrs of shots. There are equal risk factors on both sides to consider. A family history of auto-immune should play a very large role in making the decision to vaccinate. Even with that decision should come the mindset of delayed schedules. There is so much research to support that these antibodies are not working. My husband had whopping cough and was vaccinated. Does the media make a big deal of that? Nope they just want to attack the anti-vax. Linda, the fact that TDaP is not tested for safety during pregnancy does not help your case. It’s right on the insert. And if these mothers were vaxd appropriately as children, are you saying their shots are not effective, requiring yet another? I’m sorry, but your case is less than compelling as far as I’m concerned. I am faced with a situation that I would like to hear someones thoughts about. I have three children who have not been vaccinated ages, 11, 8 and 6. My sister recently had a baby, born prematurely at 35 weeks, and she has asked that my children not be around the baby unless they have vaccines. MMR (for the measles) and dTap (for whooping cough) in particular. She lives in Culver City, California and said that there is a whooping cough outbreak in the Santa Monica area amongst unvaccinated children. She said she does not want her son exposed to my kids for 1 year. I understand her concerns. 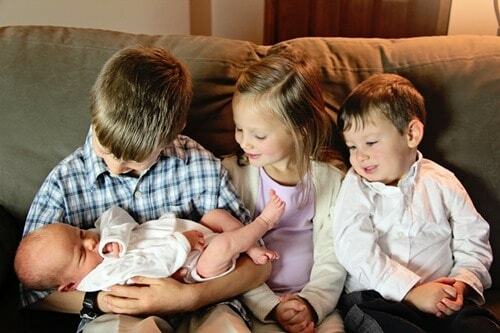 I’m wondering if I should go ahead and get those vaccines for them so that they can interact with their new cousin, or to wait it out. ugh, what a tough emotional situation. 🙁 I do agree with Sara firstly, definitely depends on your reasons. Your kids are at least old enough that some of the objections health-wise that people have to vaccinating are non-issues now. Here’s the thing though…while I understand your sister’s concerns, and actually I have a few people in my life who feel that way, your kids aren’t any riskier than her taking the baby out in public at all. If I had a preemie, I might keep ALL children away, personally, for a month or two. But after that, life is a risk. You should ask your doctor about this, but I don’t know that your kids would be able to get full immunity in one year if they are completely unvax’d now. I don’t know how long one must wait between shots, but it’s a lot to try to jam in at once, no? Good suggestion Katie for the titers. They may already have the immunities she is concerned about. I would tell your sister that vaccinating your children will likely not reduce the risk of her children getting pertussis or measles and to look at the data of measles, pertussis outbreaks which show that the vast majority of outbreaks were in highly vaccinated populations. Further, vaccinating your children presents risks to your children that you obviously felt outweighed the benefits or you would not have avoided vaccinations. Then I would tell her to read the book “Dissolving Illusions: Disease, Vaccines, and the forgotten History. “. If she does she may never forgive herself for having subjected her children to vaccination. If none of the above changes her position, tell your sister that you will not subject your children to great harm to be with her and her children. I think you need to read the 14th amendment for yourself. The Fourteenth Amendment’s Due Process Clause has a substantive component that “provides heightened protection against government interference with certain fundamental rights and liberty interests,” Washington v. Glucksberg, 521 U.S. 702, 720, including parents’ fundamental right to make decisions concerning the care, custody, and control of their children, see, e. g., Stanley v. Illinois, 405 U.S. 645, 651. Pp. 63-66. There is a presumption that fit parents act in their children’s best interests, Parham v. J. R., 442 U.S. 584, 602; there is normally no reason for the State to inject itself into the private realm of the family to further question fit parents’ ability to make the best decisions regarding their children, see, e. g., Reno v. Flores, 507 U.S. 292, 304. The Troxel “fit parents” presumption may be rebutted by a showing that a parent is unfit, but such showing is necessarily one that must be addressed on a case-by-case basis. When the state requires all parents to see educational material as a prerequisite to exercising the exemption, the state is presuming that all such parents are unfit to make the decision, without the required showing. On that basis, an educational requirement is unconstitutional and must be removed. I hope that clears thing up for you; now to go clear things up in the post! Thanks Julie! No need to clear things up for *me* – I know what the 14th amendment says (and how to do a direct quotation). I live in CA and because we are a border town my outlook on vaccinations is very different. I have had all my children vaccinated because we live next to a country that does not vaccinate and often has polio and other outbreaks that had become all but a thing of the past here in America. We are currently dealing with an outbreak of the measles(17 outbreaks in our county, that’s county, not country, in just the last week). The outbreak has been directly linked to Disneyland, which is visited by thousands of people a day and makes keeping the outbreak local impossible. Our local hospitals have had to strongly regulate who comes and goes as the measles are very contagious and airborne. It can lead to death in small children in some cases and hearing loss is also a possible result. Many of the doctors who are seeing these cases have never even seen the measles in their careers, so to see this many is definitely upsetting. I feel like the vaccinations have prevented my worries, especially at times like this where I would be scared to death had they not had them. Here’s my solution: homeschool! When you homeschool, at least in CA, you can keep your own waiver on file with attendance records. No more govenment intrusion about your medical decisions. The more I read and know, the farther I want to keep from vaccinations. You’re definitely not alone in that – but homeschooling is a complete lifestyle decision, and not all family structures, personalities or skills are a good fit for homeschooling. We want those people to have the same rights for their child’s healthcare as you enjoy for their education. I’ve read your blog for some time and you’re one smart cookie. Have you considered that your children may thrive as much or more under your tutelage? I don’t recall if you’ve ever mentioned your thoughts on homeschooling, so maybe you have reasons not to, but if not, the water’s fine…! Thanks for the compliment! I’m a trained teacher, and I sort of “homeschooled” my first for 3 and 4yo preschool, but I fall into some traps – I would spend wayyyy too much time creating my own curriculum and looking up activities online, and I am the sort who needs some break from the kids I teach. I could totally homeschool my oldest, actually, but my girl…she would fight me on everything and the tone of the household would get negative, fast. So I’ve definitely considered it, but I don’t feel it’s right for my personality. It is so sad to see that Michigan is still trying to bully parents into this. I have a son who is now 33 who was born at 26 weeks. We were one of the first in Michigan to request that our child go to public school with out any in his case and some in his siblings cases of their shots. With “M” it was not to bad since he had medical reasons, they could not understand that because of his medical (and by they I understood how much harm they could cause to my children) that my other kids were not going to get them either. We spent a full school year with paperwork, school boards and lawyers only in the end to have CPS called on us and they did threaten to take my children away for “neglect” Fast forward another 5 months of fighting, more paperwork then I ever saw and we in school. The fight was only starting as it was “known” that my kids didn’t have shots.. each time they had a cold someone would think it was something else, each time there child was sick they would ask if my kids had been playing with them. There were even parents who would not send their child to birthday party’s as they may “catch” something at our house! Its not only the state that needs to understand the harm these can do to our children, parents need to understand the choice. They need to respect that some of us for many reason choose not to, that does not make us bad parents. No one questions our choice of food (we are vegans) but everyone had something to say about our health choices. Education is needed for all, thank you for taking the time to keep that education going! The battle keeps going as they go to college and move on in life. I have one who even had it questioned in a job interview as there was travel in the job. Your freedom ends at the point your fist connects with my nose. Similarly, your freedom to not inoculate *your* child ends at the point that your child makes my child sick. There are outbreaks of polio, measles, and other diseases people had considered extinct because of parents listening to lies about vaccines and autism and other such nonsense. Simple summary: you don’t want to give your kid shots? OK. You have just waived your right to public schooling. Yes, I am a parent. My 2 year old is fully up to date with all vaccinations. If your analogy held true, my child would have to have 100% chance of getting your child (or some other child) sick. It also would mean that if my child was vaccinated, there would be a 0% chance of him getting another child sick with a vaccine preventable disease. That is not the case. Me not vaccinating (or partially vaccinating) my child is more like *thinking* about punching you in the face at best, certainly not like taking action. There is no legislation against thoughts or possibilities. no, that’s not the case at all. It’s called “herd immunity”, which is breaking down because of people not vaccinating due to absurd fears. Whatever. I give up. You’ve all made your minds up that vaccines are bad. Wow. Good thing you even know better than the CDC who prints on all their pamphlets concerning vaccinations that there is a 1 in (insert # here) chance that this vaccine will cause a terrible reaction in the recipient. If that happens call this phone # as soon as possible…. etc. Absurd fears? Lies? Nonsense? There is not a doctor or drug scientist out there who would say the ‘fears’ or reasons, brought up by parents trying to dig deeper, are unfounded. They would say it is a matter of risk either way. How much risk will you take on one end to possibly mitigate risks on the other. More like algebra than nonsense. There are many who have compelling medical history to back up their reasons to not vaccinate their child. That is being a responsible parent. Also, vaccinations do not guarantee immunity. Some have not made up their minds – either way – would you have someone just follow along blindly without asking questions if they are presented with basis for caution? You seem like a thinking man, shall not others be given that same privilege?Does a decision you may not agree with make it ‘us against them?’ You saw the numbers. 5% not vaccinated is breaking down herd immunity? Isn’t that the reason for herd immunity? So the 95% can keep it all going strong? I’ll stop with my 20 questions now. Just, please switch to decaf, no one is against you or your kids, and public school is paid for just as much by those who choose differently than you, and those who don’t even use that system to educate their children, so yanking that right would yank some cash flow, and the government is never happy with less cash, so I don’t see that happening. I believe that comments like Stuart’s reflect simplistic views of vaccination, and that the facts of the matter are far more nuanced. We do not vaccinate at all; I believe that parents should have the right to do so or to decline, just as they should have the right to accept or decline just about everything else for their child. there is no – zero – zilch – nada – evidence proving any link between vaccines and autism. The Wakefield study that purported to show a causal link was FRAUD. It was paid for by lawyers who wanted to sue Big Pharma. Once this link was shown, the study was officially withdrawn and denigrated, and the doctor responsible for it – Wakefield – has been disbarred from acting in any medical capacity on 3 dozen charges including “abuse of developmentally disabled children”. It is not nuanced. Failure to vaccinate your children is grossly irresponsible, and people who keep pushing the “vaccines cause autism” link should be tried for crimes against humanity. Well, this is precisely what I mean by oversimplification: the supposed autism-vaccine link had *nothing* to do with our decision not to vaccinate. Whether or not Wakefield is a fraud– and frankly, I haven’t done much looking into it– wouldn’t change our decision. To suppose that autism is non-vaxing parents’ main concern, or to suppose that parents only started to decline vaccinations post-Wakefield, is absurd. Just wrong, Stuart. Just wrong. Don’t refuse to click on the link and repeat to me that there is “no evidence.” Seriously, don’t. And don’t ever say another word about Dr. Wakefield because you have clearly not read anything legitimate on that subject. I, on the other hand, have actually spoken to him. Second, parents’ concerns are MUCH greater than that. How are vaccines affecting the development of a normal immune system? Gut flora? TH-1 vs. TH-2 immune system? Do you even know what I’m talking about at this point? I could go on. But I won’t. The evidence is there, you just have to be willing to actually read it. You’re getting a little disrespectful here; we’re all parents trying to do best for our children, believe me. Non-vaccinated people are not monsters. Rebekah means the situation is more nuanced – it doesn’t boil down to one lousy doctor and his improper study. There are sooooo many facets to each of the dozens of vaccine decisions that parents make – and I hope that you, too, consider each vaccine as a decision, not something that you should do simply because the government has said it’s helpful. Our family doctor, an MD, said that over the years his skepticism has increased as he sees vaccines go on and off the market, then back on again. He sees the population being used as guinea pigs to an extent and is disenchanted. I feel similarly…and I’m not sure our decisions are the right ones, but they’re the best for our children, for now. Are you aware that 67% of parents with autistic children say their child became non-verbal and withdrawn with in only a few days after receiving the MMR vaccine. Pardon me if I pick the wrong terminology but I was thought that would be a high enough number to suspect causation or at the very least correlation. There are thousands of articles that can swing it either way trying to prove/disprove etc. We as parents still should have a right to decide what toxins to subject our own children to without being bullied. Very informational!! I plan to write signed under duress if I can not cross out what I do not agree with. Also just fyi is is a law that Cps in michigan cannot investigate for failure to vaccinate. At least we have that going for us. Thank you for putting this information together Kate! I’m paranoid about these forms as well this post kinda relieves some of those fears. I don’t agree with what the Health Dept worker said to you that CPS doesn’t care about those who waive. Why would they even note it in the files if it wasn’t a concern to them. Furthermore, maybe it’s not the next CPS worker but a judge who disagreed with your decision. Ask the mom in Manistee County who just lost her medical rights over her own child because her child’s dr didn’t agree with her after he contracted whopping cough. The Dr hired an attorney, convinced the child’s father, mom was in the wrong and now that Dr has all medical authority over this child’s care. I wish I had saved the name of that Dr so I can avoid that practice at ALL costs. So scary how arrogant some are in the medical community. May God help us! The part about the parent needs to explain their reason for each vaccination on why they are waiving it. Is that how the new rule is written or is that what the health dept. worker told you? I am not opposed to them feeling like they need to educate people who they feel may be uneducated on the subject but I am extremely opposed to the wording they are trying to force people to sign AND explaining each vaccination waived! I wonder if they would accept me stating my child’s medical history after his vaccination and stating that my old pediatrician refused to sign his medical waiver because he didn’t want to acknowledge it and in fear of more parents waiving vaccines! I’m glad you asked that question – I had to go look again for myself since it’s been a few weeks since I immersed myself in this information. Looks like, from what I can see, that’s not in the official rule…the official thing is just to go in and to use only the form from the state. I don’t think you have to have a “right answer” or that any aren’t accepted, you just have to sign. Unfortunately I had to unsubscribe to your newsletter and Facebook groups because I find your anti vaccination stance abhorrent, immoral (I say this as a fellow Catholic), and grossly unscientific. I have to worry about my infant getting measles now, a disease that was all but eradicated here by 2000, because of ignorant mommy bloggers. I hate to lose you, especially over what I hope is a misunderstanding – I am not anti-vaccine at all. I view vaccines as a dozen different decisions for each child (lucky me, I get to make 48 of them). I don’t think the issue is black and white at all, and I’m constantly doing research (the latest was another hour reading journals on the measles vaccine and auto-immune disease). I do think it’s important for parents to have the ability to waive certain vaccines (even if they just want to avoid the newer chicken pox vax until it’s been around longer) or delay the schedule until a child is over one, over two, or whatnot. So…I totally respect your decision to opt out, but I hope my position is less extreme than you thought. (Wow, that’s a hefty link! Sorry, I don’t how to shorten things like that.) One of the things they talk about is how some vaccines are failing, including the pertussis vaccine. Well, we just received our information today regarding our need to go to the health dept and be “educated” in order to receive the waiver. I found your blog while searching for information regarding the waiver language. Your blog addresses a lot of my concerns. Not to mention that if the purpose is to educate, then in the interest of being non-discriminatory and upholding the 1986 federal law portion which requires vaccine education to be given prior to vaccination, then all parents should be required to undergo the same education upon entering their child in the settings listed under the new law. I also have a problem with them requiring it of private institutions who do not receive state funding. I’m paying for a private religious school, plus taxes for public education, yet the state is still able to dictate my child’s attendance or not? That seems a bit illegal. I will be writing our legislators. I may be contacting the aclu. This is crossing so many lines that I don’t know of I’m comfortable with. The language, while better than I expected on the waiver, still is one sided and doesn’t involve the risks involved with each vaccination… Simply that by not doing so we are putting our child at risk. That’s an incomplete picture and seems to me to be accomplishing exactly what you said – self incrimination. I can see the point in some of the vaccines, yet why on earth should we be requiring non-communicable vaccinations? Why those for stds in elementary school? This whole issue makes me sick to my stomach and is making me step a heck of a lot closer to homeschooling, which to be honest, we may be doing until this law is recinded. I don’t know if you noticed but the bottom of that form you linked says this is not a waiver form? What is it then? I’m having a big problem signing anything thing that states those things. I’ve also heard that because it’s witnessed and drawn up by the American peds legal team it is a legal and binding contract. Which sense it says what it does above where you sign no way in hell!!!! Homeschooling if I have to. I am not from Michigan, but know that the CPS in my state of Pennsylvania doesn’t care too much about vaccination. A non-vax friend had some trouble with CPS for some false accusations made, and CPS never said a word about them not being vaxed, even after 6 months of CPS involvement. Our state is currently allowed religious, philosophical, and medical exemptions although the freedom of choice is being threatened right now. My mother had polio. She was one of the “lucky” ones. Most of her friends that got the disease ended up in an iron lung or died. She was in a wheel chair an then later a leg brace for a while. I had the measles when I was about 12. I was so sick. They wouldn’t put me in the hospital for fear of making other patients sick. I can still see the worried look on my parents’ faces. I couldn’t go to school for two months. So yeah… I vaccinated my kid and she is vaccinating hers.